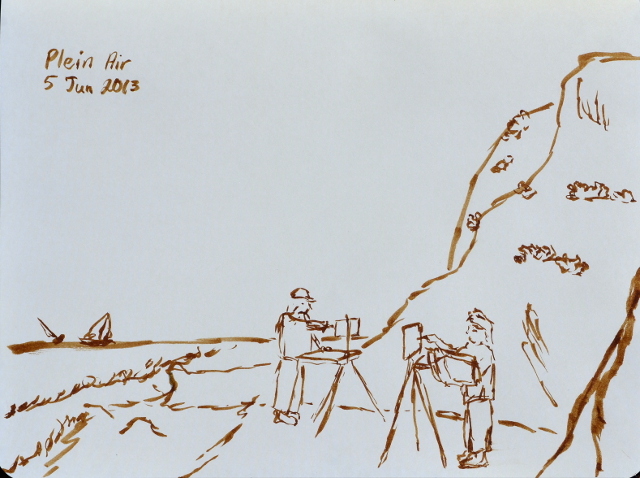 I found a couple plein air painters on the beach and sat for a moment to sketch them. The tide was starting the threaten. 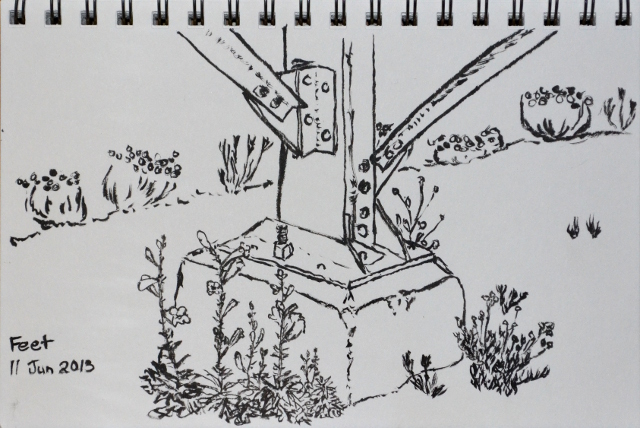 Another trip up to Nordhoff, another look at a bit of the tower. Wandering around Colson Canyon on another trail, or at least what remains of it, up to the ridge road and back around. I had jury duty, so why not hang in the Court House's sunken gardens for lunch? I set out for Colson Canyon with the intent of doing the loop with Bear Canyon. A few loops are possible starting out near Colson Canyon Campground and heading to Peach Tree Spring and up onto the ridge. There are a couple ways to drop into Bear Canyon on the other side to meet with some motorcycle trail. Turning left to get to the road allows for a longer loop, climbing up to Buckhorn Ridge then coming back down the other side of the motorcycle loop to Bear Canyon. Turning right comes directly to Bear Canyon, then follow it down to Colson Road, nearly where it meets La Brea. (The USGS Tepusquet Canyon 7.5' 1995 marks it coming out at La Brea, nearly to Colson, but on the ground reconnaissance confirms the location on Conant's San Rafael Wilderness Guide, along Colson.) 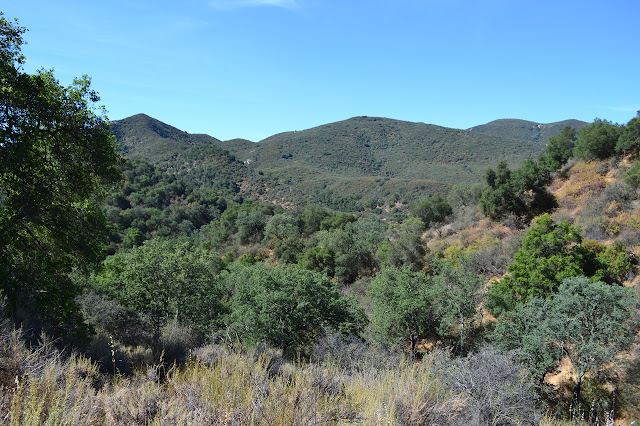 From there, it's an easy hike on Colson up Rattlesnake Canyon to the saddle and back down Colson Canyon. I parked at the campground because, well, I don't know any better and it looks like plenty of parking. The road up it is rather scary with 6" of ground clearance, but the only sounds as I went were the gentle creaks of going over uneven ground and not the gentle scrapes of insufficient clearance. I poked around it for a trail, which there is a little of. I followed one a little way and found a geocache on the way back, placed nearly a year ago and undisturbed since. I went ahead and signed the tiny scrap of paper below the lonely name of the placer. I then poked my way down to the road below and made my way to the proper trail head. This is along the road just short of the campground where there is a big sign and a few parking spots on one side and a slapstick trail marker next to a gap in the fence on the other. The trail at the start is a bit of packed dirt winding up through the grass, past a gap in the fence and a sign forbidding all motor vehicles. 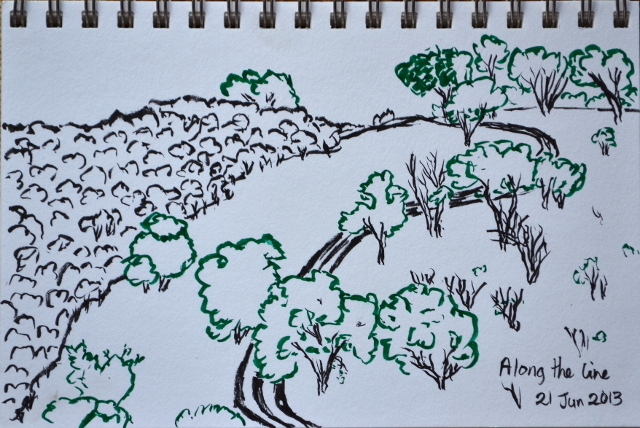 The trail looks pretty good, at first, not counting the encroaching poison oak. It has easy to follow tread, but quickly split into two equally good looking trails. I chose the one on the left and found it to be fine. After a while, it looked like the other trail rejoined again. Or it was some other random game trail with a little more travel. A moment along the trail when there are views to be hand over the canyons. Once again, the variable crew of HIKE the GEEK people gathered together to make a circuit of the Mishe Mokwa and Backbone trails. We managed to collect almost entirely at the same trail head of the two options and started off with a pretty big group. Up at the first junction, we made a right to leave Sandstone Peak, the highest point in the Santa Monica range, for last. This put us parallel to the road for a short stretch and able to see the other lot. It looked quite full, as did the one we were coming from. The trail would be crowded. The marine layer hanging over the beaches wasn't quite getting to us, so the day was warm. Looking down over the smaller, and quite full, parking lot. Why is there a bus? I blame rock climbers without any evidence. The bit of Pratt Trail from Cozy Dell Road to Valley View Camp seemed nice enough, so I've been meaning to see what the rest of it is like. The islands cleared up, which I find to be encouraging for a climb up a bit of front country because it means good things about the expansiveness of the views. 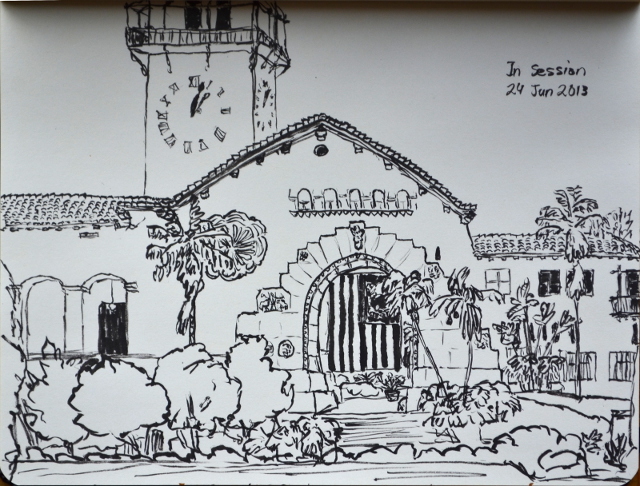 I had watercolor plans and waited another day, allowing a bit of the fog back in to fuzz things up. Never mind, I headed for the hills. The plan: hike the whole of Pratt, probably stopping by Valley View on the way up. Once up Pratt, no reason not to go all the way up Nordhoff and visit the fire lookout skeleton. 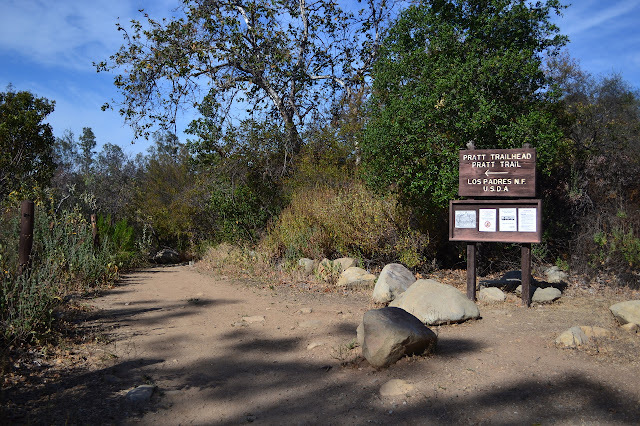 Once to Nordhoff, why not head down Gridley, which can be connected to Pratt at the bottom via the Shelf Road or Foothill Trail or Firebreak Road? 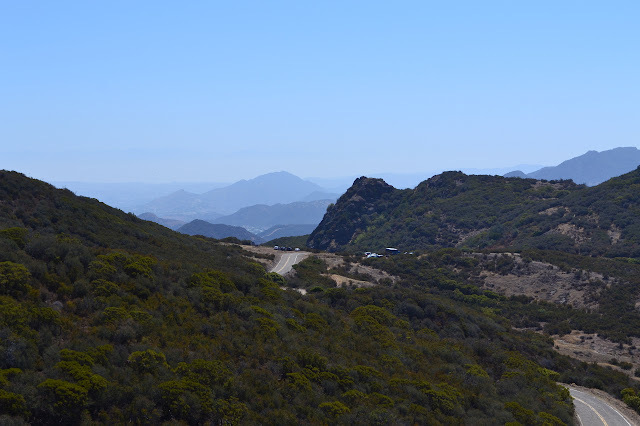 With a predicted high of 87°F for Ojai, it is getting to the point when I consider the 5 liters of water in my pack to be 10 miles worth and this plan, using Shelf Road and with the spurs to Valley View and the lookout, comes in at about 15.7 miles. I parked near the Pratt Trail Head and set off with the expectation that plans would change if the first half of the water ran out much before the tower. Signal tries to shake you off, but if you can follow it to near the top, signs will guide you to the trail head for Pratt Trail. Pratt starts off along private property. Many small trails head off the obvious main trail as it makes its way. A few of the trails probably go to someone's door, one followed some old pipes a short way, but all are obviously not the proper trail and easy to avoid. Signs point the way by large trails and driveways and sometimes when there just hasn't been one for a few feet. I saw a couple morning dog walkers and heard a couple guys conversing out on their porch as I went along. With a little climbing, the trail dumps out on the narrow pavement of Foothill Road. Following it up a little way, I finally got to the proper trail head for this route except that it looks like the general public isn't welcome to bring their cars up here. 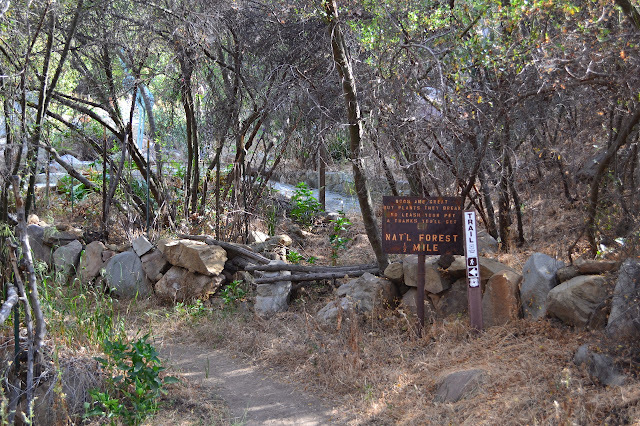 A sign by the side of the road shows much of the local trail system while advising to always hike the Ojai Valley with ample water. A little bit of poetry near one house asks dog owners to please be very sure to keep their dogs out of the garden to protect the plants. Finally climbing into the hills after one last little bit of private property, the trail is a very well maintained dirt road. 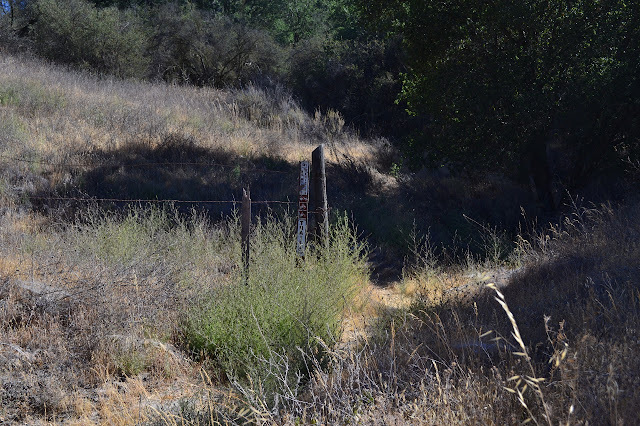 A sign marks Foothill Trail, a small track going west, very soon after the gate. 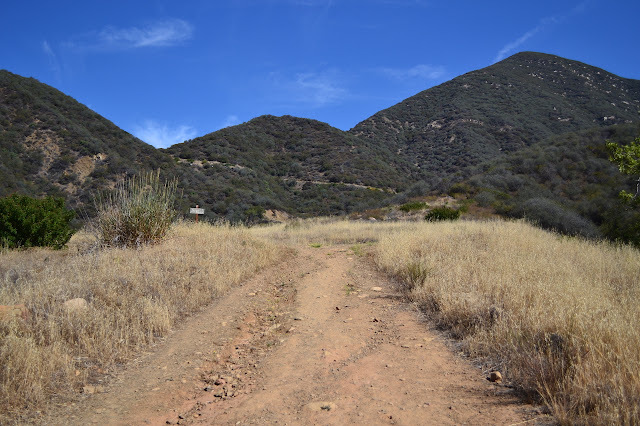 I noticed what looked like a bit of well used trail heading off to the east by a drainage, probably Foothill Trail heading west, but unsigned. Very soon after, I came to the intersection with Fuelbreak Road, where everything looked familiar from hiking Cozy Dell, just from a different angle, right down to the crazy use trail cutting from Cozy Dell down one saddle before the roads meet on their own. Coming up with the junction with Fuelbreak Road. There should be a second track to the portion of Foothill Trail heading west near this junction, but I didn't notice it. My Whisperlite seems to be coming to a pressure just high enough to use, but no more. I keep having to pump it while cooking or it will go out, but it'll still have pressure in the morning. Actually, considering how little the volume changes during use, there's probably something else wrong. I need a new pump, probably. Instead of getting a new pump, I decided to go for something that actually is extremely light, but still runs on a liquid fuel. And it can be made for under $10, a bit more if a few things aren't already had. 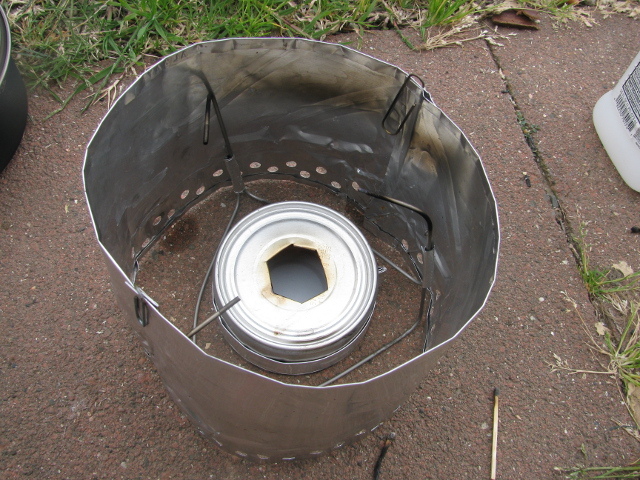 I tossed together an alcohol stove from cat food cans, bike spokes, and a lasagna pan. The stove itself is described here, although there are quite a few other places, and I took clues from there. I had to get a small cat food can, because my cat doesn't get overpriced food in tiny cans. I punched a single row of holes out with a hole punch rather than the church key on this one. The larger can has holes punched around in a double row and a smaller chimney hole based on some page somewhere. Two wide strips of lasagna pan held together by paperclips at the top and bottom and also punched with holes just goes around the pot with a little spare space for exhaust. A bit more lasagna pan is folded over to be a simmer ring. The bike spokes are bent to make a pot stand described here with the joints actually a bit more lasagna pan in strips, wrapped around the spokes a few times and glued down. A bit of found ancient fiberglass house insulation makes the wick inside the small can. It ain't pretty, but it doesn't seem to matter. I went for glue to keep the cans together, but it couldn't take the heat so they are loose. Tabs from using a church key on one of them would be handy for centering them, but this doesn't seem to be critical. The first day I left it out, a raven went after it for the lingering smell of cat food, so now it gets a pot over it or stuck in something. Fuel sources are described here. I started out with isopropyl alcohol because I had a 91% bottle of it under the sink for cleaning wounds. It lets off a somewhat sweet and likely poisonous smell as it burns, but deposits a nice layer of soot onto the bottom of the pot so the IR doesn't reflect off the shiny titanium. Now that that has run too low, I poured in some Everclear instead. This burns nicely but turns out to not be sold in 95% any more. The bottle has had the 95% blocked out and is actually claims something more like 75%. This burns much more nicely. Getting the right amount of fuel seems to be quite a game. I have poured in a bit more to start it up again and I have watched it burn for minutes after I was finished cooking. Up on Sawmill with half the water actually ice, it didn't take quite so much extra isopropanol as expected with the extra height and cold. In the Sierra Nevada, just 1000 feet higher, the ethanol somehow seemed too effective in the morning and not enough in the evening. The simmer ring is a bit hit or miss, mostly miss. It is placed to cover the holes in the bottom of the chimney piece so that much less air passes through. Basically, starve the alcohol of oxygen and it will burn more slowly, allowing simmering. Placing it on the chimney above the holes while getting the water up to heat makes moving it difficult because, of course, it gets hot. Leaving it off and then going to loop it over doesn't work so well either, because there's still a bit of a roaring flame. I have managed to poke it down with a stick for use. Half the time I have used it, there was still plenty of air getting in and no simmering was possible. The other stoves show an extra piece under the stove that I do not have because they don't say what it's for, maybe this helps with controlling the air supply. Still, it has worked sometimes and is quite handy when it does. As the stove simmers, the flame seems to breath giving bursts of heat, so it still isn't perfect, but better than constant stirring on a stove that wouldn't think of simmering.